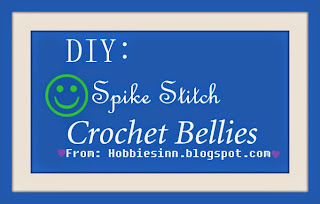 HOBBIES INN: DIY: Spike Stitch Crochet bellies. 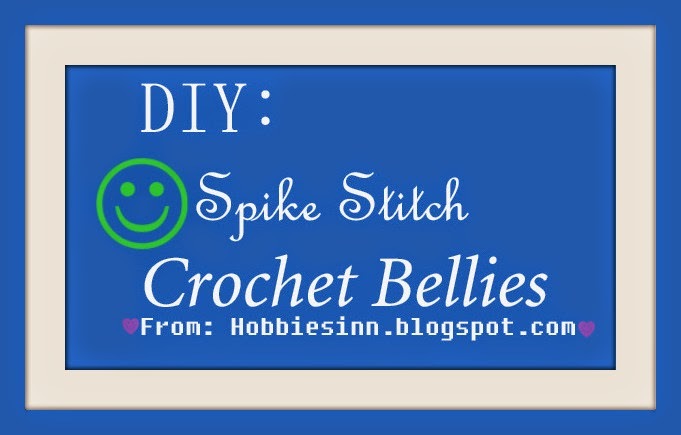 DIY: Spike Stitch Crochet bellies. Hey there its time for the Tuesday tutorial and again I'm with a unique bellies pattern. It happens to be the most easiest and the simplest of all. My next blog posts will be featuring a unisex slouchy beanie on which I'm working now and a cute finger less gloves that I'm already done with. 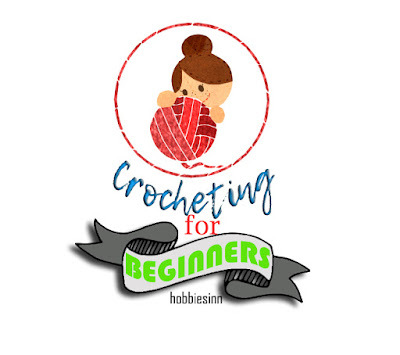 According to me crochet bellies are good for beginners in crocheting to get hold of things. Really. Your favourite coloured yarn. I used Galaxy green and a dull veridian green in this pattern. Note: I've made a double stitch in each hole of the preceding stitch and not in the stitch itself, This creates a different texture than the original double crochet stitch. 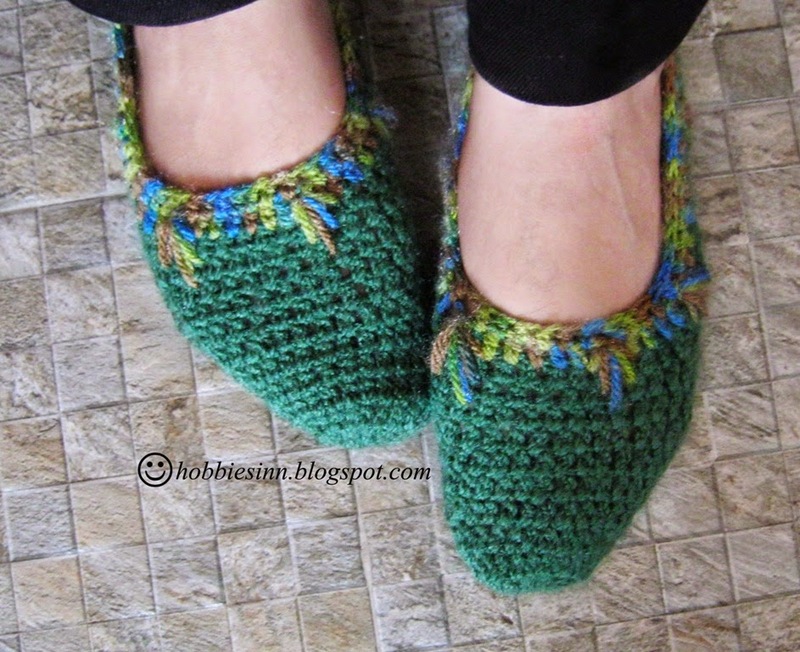 *No of stitches may vary depending upon the foot size. Rnd 1: Slp St, Ch 5, join [This makes your magic circle]. Rnd 2: Ch 2, Dbl st 11, join (makes 12 Stitches). Rnd 3: Ch 2, 2 Dbl st's in each stitch below (24 Stitches). Rnd 4: Ch 2, Dbl st in each stitch, inc 1 (25 stitches). Rnd 5: Ch 2, Dbl st in each stitch, inc 1 (26 stitches). Rnd 6: Ch 2, Dbl st in each stitch, inc 1 (27 stitches). Rnd 7: Ch 2, Dbl st in each stitch, inc 1 (28 stitches). Rnd 8: Ch 2, Dbl st in each stitch, inc 1 (29 stitches). Rnd 9: Ch 2, Dbl st in each stitch, inc 1 (30 stitches). Rnd 10: Ch 2, Dbl st in each stitch, inc 1 (31 stitches). Rnd 11: Ch 2, Dbl st in each stitch, inc 1 (32 stitches). Rnd 12: Ch 2, Dbl st in each stitch, inc 1 (33 stitches). Rnd 13: Ch 2, Dbl st in each stitch upto 20 stitches leaving the rest. i.e 13 stitches. Rnd 14: Ch 2, reverse the stitching direction, Dbl st in each stitch(20 stitches). Rnd 15-29: Ch 2, reverse the stitching direction, Dbl st in each stitch(20 stitches). Fold the ends and sew. Take a separate color yarn. Make a spike, Repeat 6 times. (30 stitches). Rnd 2: Dbl st in each stitch. (30 stitches). Rnd 3: Sn st in each stitch(30 stitches). How to make a spike? To make a spike stitch it is important to have atleast 3 rows of either single crochets or double crochets to work the spike. We start from the 4th row. 1. 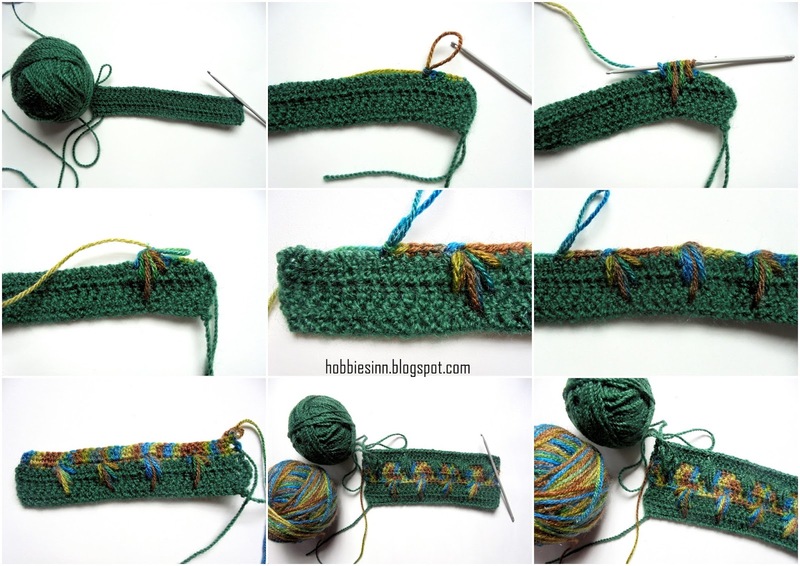 Make 6 single crochet stitches. 2. Skip 1 stitch and put stitch marker in the next stitch. 3. The skipped stitch i.e. the 7th stitch is the center of the spike stitch. 4. Count over 2 stitches over right and 1 row down. i.e. under the 5th single crochet stitch just made. 5. With yarn over your hook, insert hook in the marked stitch (2 st's right and 1 row down). Wrap yarn over hook and pull through. You will have 3 loops on the hook. 6. Now count 1 stitch over right and 2 rows down, i.e. under 6th single crochet stitch. 7. With yarn over your hook, insert hook in the marked stitch (1 st right and 2 rows down). Wrap yarn over hook and pull through. You will have 5 loops on the hook. 8. The third spike is worked straight 3 rows down. Directly under the skipped stitch. 9. With yarn over your hook, insert hook in the stitch that is straight 3 rows down. Wrap yarn over hook and pull through. You will have 7 loops on the hook. That is 3 spikes done. Now 2 more are left. 10.We move to the left now. Count 1 stitch towards left from center of the spike and 2 down. 11. With yarn over your hook, insert hook in the marked stitch (1 st left and 2 rows down). Wrap yarn over hook and pull through. You will have 9 loops on the hook. 12. Count 2 to the left from center of the spike and 1 row down. 13. With yarn over your hook, insert hook in the marked stitch (2 st's left and 1 row down). Wrap yarn over hook and pull through. You will have 11 loops on the hook. 14. Yarn over and pull through all the loops. 15. Chain 1 to close the stitch. 16. Work your next single crochet into the first marked stitch of the row. 17. Make another one after 6 single crochets. 18. You can increase or decrease the number of spikes as per your wish. Refer to picture for reference. I made spikes around the crocheted bellies. Don't they look cool?